We have just spent a mini-break in Copenhagen, and as usual landed up in a botanic garden! It’s a lovely walk up from the city centre through pleached crab apple hedges and on to a park containing some lovely specimens of Cornelian cherries. This tree bears edible fruit, many of which were on the floor, though they are reputedly rather astringent, and also used from Greece to Russia for distilling or for making liqueurs. The yellow flowers in spring are a delight in gardens in the UK too. I can’t recall ever seeing the fruit on the trees here though. Maybe this warm summer induced some fruiting? In through some buildings and out into the botanics, one of the first things you come across is a marvellous series of beds laid out with hops and other plants used in the beer industry in Scandinavia. I’m not going to list all the plants of interest here, go and see for yourself! As well as a few remaining hop plants, there are many different herbs and grains here including this Rye plant, which i wouldn’t have recognised. Next to the Beer garden is a good display of European native plants, to the untrained eye it looks like a big patch of weeds! Which actually many of them are! Beyond this we came across a group of quinces, upon which the smell from masses of ripening fruits was almost overpowering! The final lasting impression I had was of the many Mistletoe plants on the trees in the surrounding woodland area, giving an impression almost of a tropical forest of Bromeliads. Last year I reported on a trip to the Jerte Valley in Extradamura where I saw many Cherry trees. And in fact upon my return i found them for sale at a farm shop in Angus! Last month ( March) I was again in Spain and visited both Madrid and Cordoba Botanic Gardens. Both had collections of herbs and fruit trees, but Cordoba also had splendid indoor displays of Olive, Vine and other traditional crops used for making baskets. However my best experience was seeing the extent of Olive growing in the south of Spain as I literally cycled through 200km of Olive Orchards! I am beginning to get the impression that Spain does its horticulture at a big scale. If ever there were a disease to hit these trees, then the economy of the region would collapse overnight. The last of the trees along the Via Verde del Aceite were being harvested as i cycled by in early March; I scrumped a few, and was surprised to find them bitter and producing a red stain on my fingers. So much for olive green! Apparently ( according to wiki) they all need to be partially fermented to make them palatable. I saw men using sticks and a Stihl machine with a long vibrating pole to shake off the last fruits, which were then raked up by hand. Surprisingly few varieties are grown commercially, and the dozen or so countries growing them tend to have their own favourite varieties. It is a growing industry, olives as we know being associated with healthy diets. Spain is by far the biggest producer, followed by Italy, Greece, Turkey and Morocco, with US and China all getting in on the act it seems. It is suggested that they are not self-fertile, so a mix of varieties is necessary. 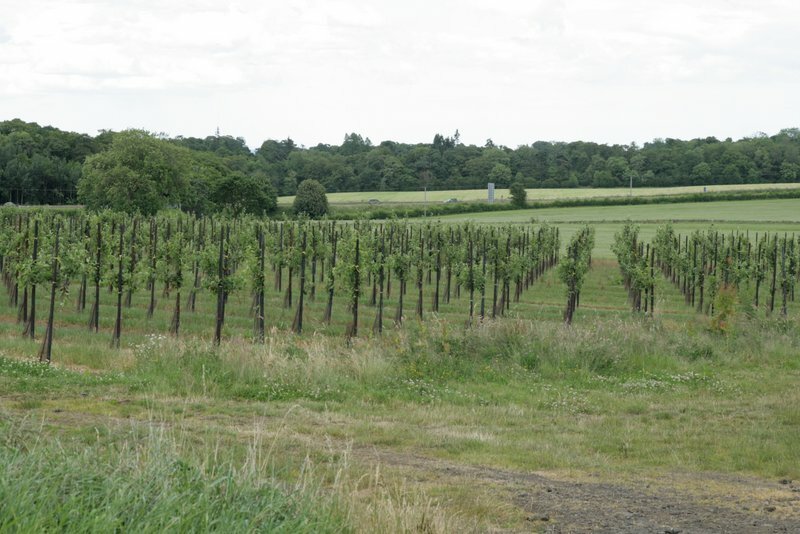 I couldn’t discern a mix of trees myself, but there were orchards with a slightly greener leaf colour. The pollen can cause considerable irritation and it is windblown to boot. Glad I don’t live next door to an Olive Farm! My biggest concern was the fact that there was no ground flora beneath these orchards, or very rarely a patch of yellow flowers, and as a consequence the heavy rains have caused a considerable amount of erosion on the hillsides. The area I travelled through was predominantly limestone and I would have expect to see a good number of flowers. Pruning was being carried out in many orchards, and seems to be quite brutal with big limbs being cut out of the middle of the trees with chainsaws. Presumably this is to let light in, and to facilitate easier harvesting with many horizontal branches. The spacing between the trees was very wide, well over 8m. Only later from the train window did I see some intensive orchards, with trees planted very close together in lines 3m apart or so. These were quite possibly pruned with hedgetrimmers. I wonder what the productivity is of these trees compared to the more extensive systems? Unfortunately i couldn’t find anyone to ask. However i’m now back home and enjoying some big Olives Margaret bought at the Deli in Dunkeld. Alas I don’t know where they came from but I will be taking more interest as to where they originated and the variety in future! Yeah, its the blue town and full of tourists. And hash punters. My wee hostel was run by some permanently stoned guys, what a waste! But what a pretty little souk of narrow blue painted alleyways, lovely at night. A wee boy put the finishing touch to a wallet I had made for me. The market day drew in rows of Rifian men and women, here to sell a few cabbages and onions and buy their own shopping before returning. It’s a very hard and simple life for these people…other larger traders had oranges and apples, olives or spices. These palm shoots intrigued me. One of the wee squares was piled up with firewood for the Hammam Public Baths, a pleasure I didn’t find time for on this occasion. Heading down from Chef to Fez, I was struck by the oranges, and beans and others cereals sown underneath the Olive groves. At lower altitudes, there were larger fields of cereals and co-operatives with a more commercial layout of large fields. Almost no hedges or fences exist in Morocco. The sheep are constantly herded to prevent straying; even the motorway verges are grazed between Fez and Rabat! I have just spent a few weeks in Morocco on a farm and travelling around and thought i would record some of the events here. Those of you who have visited this fascinating country will be familiar with much of what is to follow! I failed to secure a hostel in any of the Spanish enclaves so plumped for the longer ferry from Algeciras in Spain to Tangiers Med port.A lovely way to enter Africa, but not without a last breakfast of Eggs and bacon on the ferry. Then refusal to pay 200 dirham for a grand taxi toute seule, ( thanks Lonely Planet my trusty companion ), and eventually got crammed into one with 4 others for a mad dash to Tangier bus station for 30 dirham. And there I enjoyed my first chaotic experience of the bus stations in Morocco, albeit with a few exceptions like the lovely CTM one at Tetouan. Anyway, I now knew to look for shared lifts, and waited patiently for a cheap shared grand taxi to Assilah. There’s always a headman ready to guide you …its actually quite a good system. But good to get away from that busy place and arrive at the wee town of Assilah by the sea ( though crammed in with 6 others this time! ) .Miles of beaches along the coast en route. My memories of this place are of children moving to and from school at all times of the day, great mint teas, Spanish being spoken, prayers called at 5am, and the one shop with beer for sale! I love the fact that you can enjoy a cup of good coffee, buy a delicious local artisan oatcake or black pudding, and pick a few fruits for your pudding in one short trip. These are things you cannot do in style in the crowds and hassle of a supermarket. My most recent trip was to Craigie Farm Shop near Kirkliston, a pyo farm, much of which was open to the public.On a Sunday afternoon it was very busy, but there are lots of seating in and outside the cafe, and I like the idea of the canine cafe! However poor Jed was banned from the fruit growing areas, the impressive polytunnels with table tops groaning with strawberries and pots of raspberries. I have seen this square block of trees developing over the last year from the dual carriageway into Edinburgh, and was determined to check it out. It is as I thought, a very exciting new development in top fruit growing in Scotland. There are about 15 lines of very closely spaced trees, at one meter, on very dwarfing stocks of M9. It all looks very well managed, and very productive with sunset, worcesters, katy etc. all yielding fruit in this rather mixed year. Very good to see that lines of Italian Alder have been planted as shelter belts also, a necessity for this easterly plot way down the bank, whereas some cherries further up near the cafe seem to be more exposed. Back at the shop we picked up a few punnets of fabulous rasps and gooseberries and set off home very pleased! The farm is not organic, but allows the public to see into the tunnels so common in Perthshire, with real commercial horticulture in action, weeds and all! We will certainly be back, hopefully at a less busy time to speak to the ‘patron’ and of course for the harvest of apples! 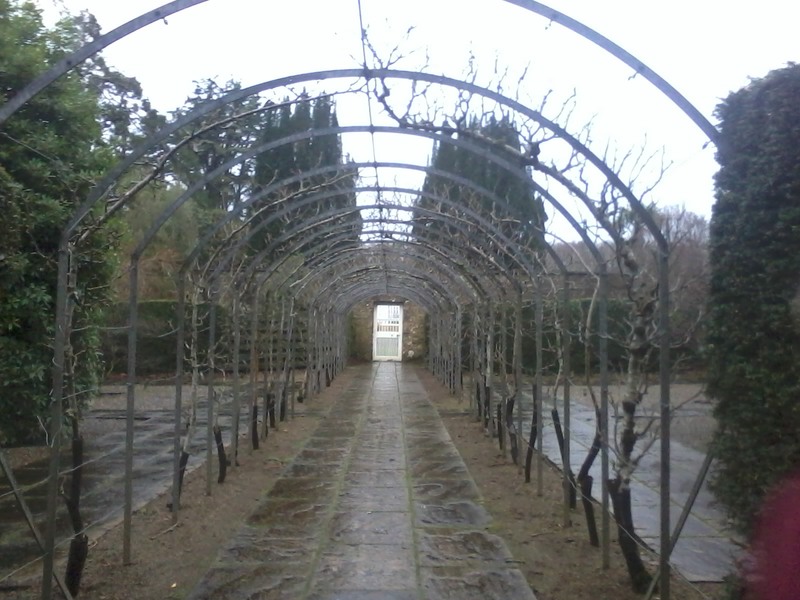 There are Parrotias, Sciadipitys and Myrtles with their beautiful bark to delight in Happy Valley, and a beautiful arch of old Scottish Apples at the back of the walled garden. If you want to see a good selection of Scottish fruit, visit in early autumn. You will find Oslin, Stirling Castle, Bloody Ploughman and East Lothian Pippin here which I planted in about 1992. They have been kept beautifully as cordons, some making strong growth and thick stems, though all were on dwarfing rootstocks. There are also many fruit trees within the walled garden, including a unique Scottish variety, Culzean Seedling. Also of great interest to fruittreemen (& women) in the walled garden is the enormous Fig tree in the south east facing corner of the wall, which has layered itself along the ground to a large extent. It produces lots of fruit and has to be rigorously controlled each year, such is the advantage of a good wall to plant against. Do visit this gem in West Scotland and enjoy!